The modern electronic device is made up of an impossibly large number of imperceptibly small parts. A laptop computer, for instance, may have 1.5 billion transistors or switches, says Dr. Nicholas Strandwitz, assistant professor of material science and engineering, and each switch is no more than a couple nanometers–or billionths of a meter–thick. Thin film growth is the process by which these infinitesimal parts are created, and Strandwitz specializes in a specific type of thin film growth called atomic layer deposition, or ALD. "It's a process that's done in steps," says Strandwitz, who is affiliated with Lehigh's new Interdisciplinary Research Institute for Functional Materials and Devices. "A surface is exposed to molecule A, forming a single layer of A molecules. The A molecules that are not in the layer are removed and then the surface is exposed to molecule B. After these steps, precisely one tenth of a nanometer (A million times thinner than a human hair) of the desired material remains." Strandwitz says the size of a computer transistor 30 years ago was roughly several hundred nanometers, but that has rapidly shrunk to the scale of the truly infinitesimal; thus, understanding and perfecting this process has grown increasingly important. "Transistors are scaling down to ten, eight, five nanometers," he says. "Scientists are actually approaching the ability to produce transistors that are similar in size to just several atoms, with dimensions a few nanometers. This is making advancement in ALD thickness control crucial." "If the semiconductors in your next laptop need to be exactly 2.5 nanometers in order to work properly, ALD can be ideal," he explains. "Scientists can simply repeat the process until they're reached the desired thickness." However, imprecise thin film growth can cause an entire system to fail. "If that laptop's semiconductors are two nanometers thick, a mere half nanometer short of the manufacturer's goal, the laptop may heat up and catch fire," he says. "But if it is three nanometers thick, the switches won't switch, and nothing works." Strandwitz says it's critical to keep temperatures relatively low in order to prevent precursor decomposition during the deposition process. But low temperatures may influence the atomic arrangement–or crystallinity–of the film itself. "If the temperature isn't high enough, atoms can't really move around once they hit the surface, and they get stuck in a certain position," Strandwitz says. "In some cases, however, we want to coax the atoms into a crystalline structure; this can have a dramatic impact on the electronic properties of the material, and hence the behavior of the device itself." So while ALD's thickness control makes it an appealing option for precision thin film growth, this temperature issue limits its usability in some applications. To address this problem, Strandwitz is exploring a multi-step method, including a new process for observing the chemical processes that lead to a reconciliation of ideal thickness and control of crystallinity. This work was the subject of a recent Faculty Early Career Development (CAREER) Award from the National Science Foundation (NSF). Strandwitz's project, Probing Crystallization of Atomic Layers Using In Situ Electron Diffraction, provides his lab with more than a quarter-million dollars over five years to support technology development, student research opportunities, and community engagement. According to the NSF, its CAREER Awards support emerging academic leaders who have demonstrated potential to serve as role models in research and education. For rising academic researchers in science and engineering, there isn't a more prestigious award from the NSF. "We're starting with ALD to put down one or two atomic layers," he says. "Then we'll heat it, to give it some more energy so that the atoms can rearrange into an ordered, crystalline structure. Necessary chemical reactions will have occurred before any rise in temperature takes place, in order to remove decomposition of the molecules from the equation." Strandwitz adds that measurement of the chemical reaction during the heating phase would be "excruciating" without the ability to observe it in situ, or as the process is happening. "So while we're heating the layers," he continues, "we aim an electron beam at the surface at a very low angle. An electron will hit the surface, bounce off, and hit a screen that we'll attach to our equipment at a short distance. Where these electrons strike the screen allows us to infer crucial information about the crystalline order of atoms, in real time." The technology is known as RHEED–or reflection high energy electron diffraction. Strandwitz says it works like the colors that appear when a thin film of oil forms on a puddle of water. "Photons of light get reflected from the place where the oil meets the air to the place where the oil meets the water," he says. "Depending on the thickness of the oil film, some colors of light will destructively interfere with one another, removing them from the otherwise white light, creating the appearance of colors in the fluid." The same principles are at work when RHEED is applied to a material, except that electrons, rather than photons, are reflected off the atoms. "If we're slowly heating a sample up from 100 to 500 degrees Celsius, RHEED allows us to observe structural changes as they occur throughout the process," Strandwitz says. "We'll know exactly the temperature and the conditions under which these essential structural rearrangements occur." Strandwitz believes that knowledge gained from this procedure will enable a new class of functional thin films. "You can imagine labs or companies performing this process sequentially–crystalizing one atomic layer, repeating it, crystalizing the next one, eventually growing a thin film with the desired thickness and the other properties required for a given application." To conduct these experiments, Strandwitz says he and a new Ph.D. student will be spending about a year developing the equipment–but the first step in their process is already complete, courtesy of an innovative campus program that aims to provide students with more hands-on learning experiences where they can "find their passion" and experiment with innovative projects. According to the Lehigh Office of Creative Inquiry, the University's innovative Mountaintop Initiative projects are "interdisciplinary deep dives where faculty, students, and external partners come together and take new intellectual, creative, and/or artistic pathways that lead to transformative new innovations, new expressions, and new questions." Strandwitz explains how this undergraduate-focused "experiential learning" project yielded dividends to his ongoing research endeavors. "The base ALD machine was designed and constructed as part of a Mountaintop project in the summer of 2016," he says. 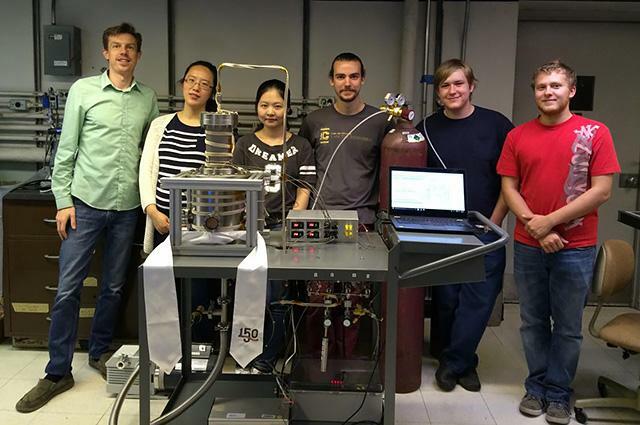 "Our team consisted of myself, a Ph.D. student, and four Lehigh undergraduates. With financial support from the Mountaintop Initiative, and some spare parts we found around our main lab, we built this system with the future expectation of adding a RHEED gun." With the NSF's recent support, Strandwitz will modify the ALD chamber to accommodate the RHEED gun, the electron capture screen, and the camera that records the images and sends them to a computer to be processed. He says there's also some software design he and his team will need to perform in order to integrate the systems components, including the RHEED gun. "Lehigh is renowned for its nanocharacterization facilities," Strandwitz says, "including instrumentation and equipment that allows researchers to see individual atoms and to discern features on a material's surface. This new equipment will be the first of its kind at Lehigh, and a powerful extension of our campus' world-class materials characterization and processing capabilities."